Randy Kaplan likes a challenge. …He then asks them to sign an object that – at first glance – looks suspiciously like a bomb. If the American’s 250-strong collection of world leader-signed baseballs is impressive, the stories of how he acquired them are staggering. Randy kindly paused from the autograph hunt to take us into his world, including his chance meeting with Barack Obama. 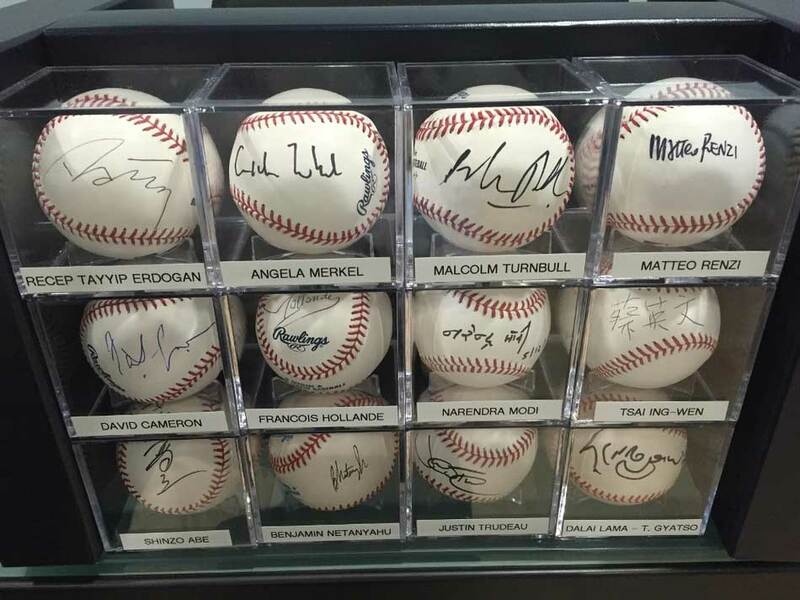 JustCollecting: You’ve been collecting world leader-signed baseballs since 1996. 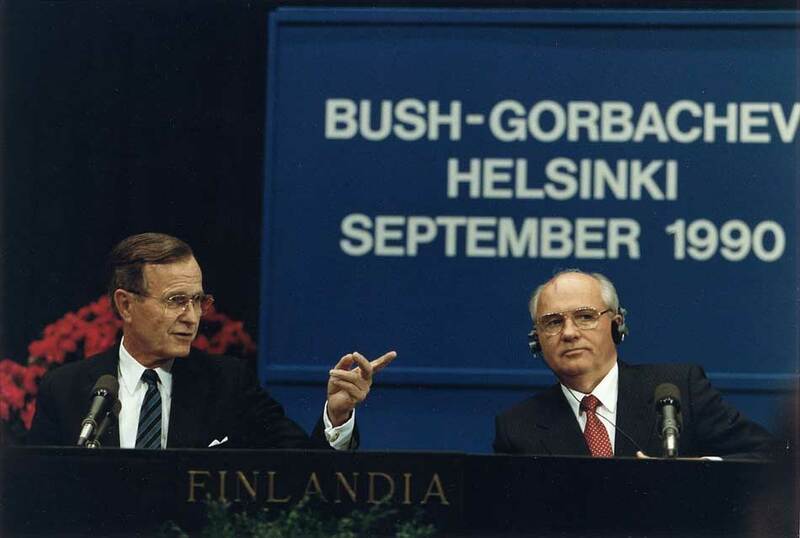 Why did you start, why baseballs, and why just world leaders? Randy: I have been an avid collector my entire life. Whether it was buying baseball cards, Topps Wacky Packages stickers, Aurora monster model kits and comics as a kid, or chasing rock star and celebrity autographs as a teenager – my passion for collecting has never stopped and eventually evolved into the unique arena I have chosen. I met enough famous people in my early life to last a lifetime. Then one day in April of 1993 my life as a collector changed. I was on a business trip in Houston and had the night to myself. After driving past the Astrodome, I began to reminisce about the 1970s movie where the Bad News Bears famously played a game at the renowned stadium. I checked to see if the Astros were in town and sure enough they were. I bought one ticket right behind home plate and the young woman sitting right next to me said former president George HW and first lady Barbara Bush attend every game when they are in town. Much to my astonishment, they both arrived right before the game began and sat just a few rows in front of me. 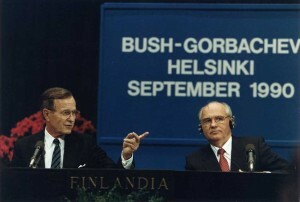 I was kind of surprised because just a few days earlier there was a failed assassination attempt on George HW in Kuwait. I immediately went into “autograph” mode and called out to the president to ask him to please sign my score card. He kindly obliged and I was thrilled. I had just met an historic figure who will be remembered for centuries. Up until then – I had never met anyone of his stature. Days after the initial excitement of meeting President Bush and getting him to sign the scorecard at the ballpark, I realized that I had committed a major error! Why did I not have him sign a baseball instead? What’s more American than the game of baseball itself? I was at a ballpark and should have known to race up to the team store and buy a Major League baseball for the president to sign. But all was not lost. 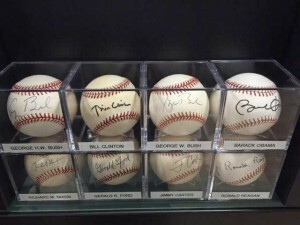 My presidential encounter with George Bush, along with a visit to the Baseball Hall of Fame Museum in Cooperstown, NY shortly thereafter, ignited my idea to collect signed baseballs from presidents and world leaders. 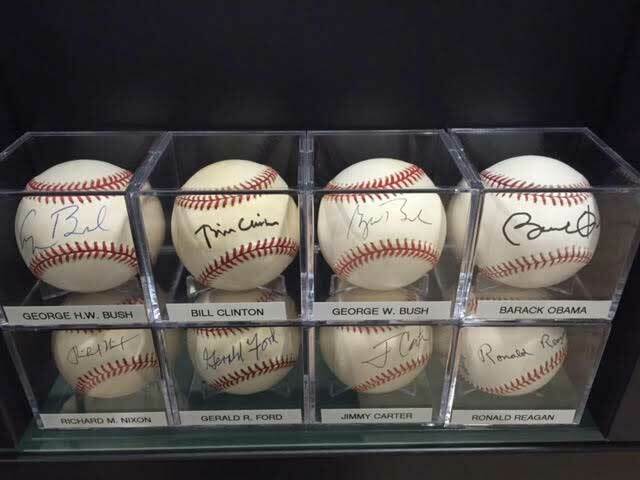 The concept is one I call “Diplomacy Through Baseball.” My desire was to obtain the largest collection of signed baseballs from world leaders and have it exhibited in museums for the public to enjoy. Fast forward to 1996 – this time as a government affairs professional for the real estate industry, I was on yet another business trip, in Washington, D.C. It was sure to be a great week as I knew our guest speaker was going to be none other than President Bill Clinton. The president was speaking before about 5,000 people in one of the major hotels and this time I was prepared! I arrived very early and got a seat maybe 10 rows back from the stage. I had a fresh Official Rawlings American League baseball in hand. The moment the president got off the stage, I immediately positioned myself near the rope line and waited my turn to shake his hand, get a picture and hopefully get the ball signed as well. 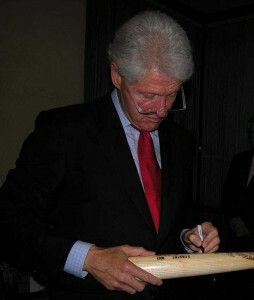 I hit a home run that day as I was able to get the current president to sign my baseball! Needless to say, I was on a “collector’s high” for many days after. I carried that ball with me over the next few days as I did not even want to leave it in the hotel room. A day later, Republican presidential nominee Bob Dole was going to speak to our group as well. This time I waited for him right by the elevator banks where the Secret Service takes the guest speakers to the ballroom. He also kindly obliged. Those were the first two signed balls I had received. Not a bad way to start a collection. I decided that collecting the signatures of just world leaders was best because it required a certain skill set, unprecedented access in an age of higher security after 9/11 and strategic planning. I knew the goal of achieving this was tougher than just acquiring ordinary signatures but the reward potential was huge. How has your role as a government affairs specialist helped you acquire the signatures? Most of what I am able to accomplish is through my own research, networking and forging relationships with many prominent people in the world of politics on a global level. However, there are certain occasions where my chosen career path has helped me immensely. There have been a few instances in the past where I have been invited to some very intimate fundraisers where former presidents and such are present. I have seen Mr Clinton probably a dozen times at some fundraisers, receptions and rallies. He has always been an incredible signer and has always taken the time to see that everyone got their requested autograph. A few years ago I attended some very intimate Congressional fundraising receptions where Mr Clinton was the special guest. I knew that this was my opportunity to have him sign something very special for my collection. Then it dawned on me, what would be the best item to complement my collection of signed baseballs? A baseball bat! I ordered an official bat and had it engraved prior to the reception in New York City. 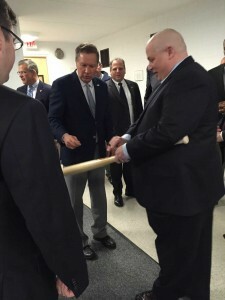 I knew that getting a president to sign a bat is not easy so this would be my chance since when there are only 15-20 people present, security concerns are much less stringent. Sure enough, President Clinton was great and signed it beautifully. 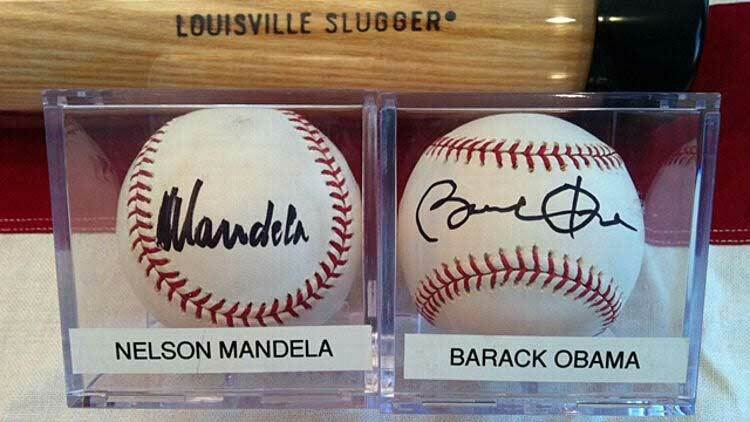 Back in 1999 – I jokingly said to my dear friend Congressman Greg Meeks (D-NY) that if he ever got a chance to take a Congressional junket over to South Africa – it would mean the world to me if you could ask Nelson Mandela to sign a baseball for my collection, which was in its infancy at the time. I had given him a few baseballs to keep in his offices in D.C and New York just in case he encountered a world leader. Fast forward to 2005, I get a phone call from Greg’s chief of staff who was very excited and barely able to tell me that the Congressman needed me to call him right away. I had a good feeling. Nelson Mandela had just made his last sojourn to the United States to meet with the Congressional Black Caucus in Washington, D.C. and Congressman Meeks was able to have Mr Mandela sign my baseball at this meeting. The only caveat was that Mr Mandela said in that authoritative voice to Mr Meeks: “I better not see this for sale on eBay!” I could not believe it when I spoke with the Congressman and he told me of this great achievement. To this day, it is among my favorites in my collection and probably one of the most sought after signatures of the 20th Century. In May of 2006, I was on Capitol Hill in Washington, D.C., preparing to go to Senator Clinton’s office for a meeting with some of my peers. While we were outside the building Senator Clinton walked by, said hello and that she would see us in a few minutes in her office. Moments later out comes the junior senator from Illinois, Barack Obama. Before he could say a word, I pulled out my baseball and said to my friends that there was no doubt that he would ascend to our nation’s highest office based on his oratory skills at the 2004 Democratic Convention. But I thought he would achieve that in a decade or so – definitely not two years later. I asked him to please sign my baseball and told him that I was pretty sure he would be president someday. He must have been laughing inside, because it was not even public that he was about to launch his White House campaign. He reluctantly signed the baseball and then asked us if we were from Chicago. I told him we were from New York. He asked yet again: “Are you sure you are not from Chicago”? We responded the same as before that we were from New York. I was not done even saying New York before the senator lit up a cigarette. I guess he did not want his constituents back in Illinois knowing that he was still smoking! Since obtaining a signed baseball bat from President Clinton – I have been able to acquire signed bats from the three other former living presidents (Jimmy Carter, George HW Bush and George W Bush). Now for the conundrum of how to get the current president to sign a bat for this special niche in my collection. 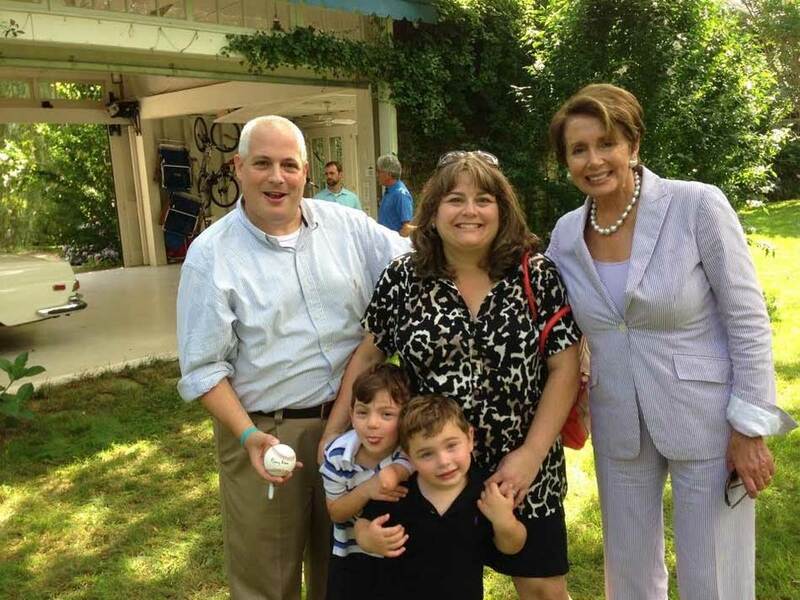 In the summer of 2013, I attended a fundraiser for then congressman Tim Bishop in the Hamptons on the east end of Long Island. The special guest that day was house minority leader Nancy Pelosi. Leader Pelosi could not have been nicer as she actually flipped and served pancakes that morning. She took a liking to my two boys and started remarking about her own grand kids. When she was done cooking, she kindly came over and took a picture with my family and signed a baseball for my collection. I floated the idea to her that I have a very special collection and could use her expertise to help me with a huge favor – obtaining the current president’s signature on a baseball bat. She smiled and her staff who were taking the pictures of her and my family said please get in touch with them and they gave me their business cards. As much as I am a believer in positive thinking, I knew this was a huge task to ask of anyone in a powerful position, let alone Nancy Pelosi. I was thinking, ‘at least I tried’. Sure enough I followed up a week later and her staff could not have been nicer. They asked me to please prepare a letter asking the president to sign my bat and letting him know all about my unique collection and the previous museum exhibits that I have had. They wanted me to send the bat to the White House via USPS mail with the aforementioned materials on my collection. I knew it would take a few weeks to clear security and such. About a month or two after I mailed the bat, I followed up with her staff and they advised me that this would be a long and arduous process. I was not concerned as this was Nancy Pelosi who was leading the charge for me. About six months later I became less optimistic, especially when I got a call from Leader Pelosi’s staff that the bat which I sent to the White House was evidently lost in the mailing process. I could not believe it! After all this planning and getting the bat engraved – was this not going to ever happen? They assured me not to worry! In May of 2014, when I was headed to Washington, D.C. for our annual meetings with our Members of Congress, they requested that I personally bring another bat to Leader Pelosi’s office in the Capitol Building. I deftly packaged the bat in sturdy tube and proceeded to fly to D.C. Upon my arrival in D.C., I immediately hailed a cab to the Capitol Building and proceeded to walk up to the iconic building with my large tube in hand. No less than 10 Capitol Hill Police stopped me and questioned me as to what I had and where I was going. Luckily, Leader Pelosi’s staffer agreed to meet me outside the staffer’s entrance. She could not have been nicer or more accommodating and assured me that they would try their best to get this special request done. And that they would hand deliver the bat to the White House. Every few months I would check in with her office and they would say, “nothing yet – but we will keep you posted”. This went on for about 18 months until that magical phone call I received recently stating that President Obama had just signed my baseball bat. I was thrilled. This was a huge accomplishment. Not everyone can get a sitting President to sign a large object like this. President Clinton was extremely generous to me while he was in the White House and signed many copies of his 1996 book, Between Hope and History for me and my friends. But that was a book – this is a baseball bat. This has to be one of the greatest autograph success stories ever! Do you keep a supply of balls with you at all times? Yes! Whether traveling in a car, on a plane or vacationing in the Caribbean – you never know who you will end up meeting. I have had incredible luck in the “chance sighting” arena in all disciplines of autograph collecting, including Sean Connery at the airport in the Bahamas, musician Billy Joel at a steakhouse in Washington, D.C. and Rolling Stones guitarist Keith Richards getting out of a cab in NYC. I even sat right next to Secretary of State Dr Henry Kissinger on a flight from NYC to Washington, D.C. Some world leader chance sightings have included President Jimmy Carter (twice) at his Presidential Library and Museum in Atlanta, and also while walking through Reagan National Airport in Washington, D.C., president of the Federated States of Micronesia Joseph J Urusemal at an airport after his speech at the United Nations General Assembly, and the recently deceased former first lady Nancy Reagan on the red carpet at an awards ceremony honoring her husband in Washington, D.C. I have nightmares about going someplace and not having a baseball with me. You use three methods of obtaining signatures: through the mail, through an intermediary and in person. Which method do you prefer and which is the most successful? Security around present world leaders must make things tough for you? Yes as you can imagine, the security in today’s world is unprecedented. Having said that, there is always a way to connect and score a “graph” – either in person or through an intermediary. Both are equally as rewarding when you score that cherished and sought after autograph. You just have to be resourceful and strategize for each different encounter. Regarding “through the mail” signatures, are you concerned some might be secretarials? How do you authenticate them? I never worry about secretarial signatures because I always do research and don’t send anything off blindly to global leaders asking for their signatures. I will make calls at all hours of the day to connect with high-ranking staffers of world leaders around the globe to explain my request and forward them info. Now that I have a website www.thekaplancollection.com and a bunch of presidential museum exhibits under my belt, many folks want to be a part of my collection. As far as authentication is concerned – I never need someone else’s opinion to advise me if it is “right” or not. I have had some very interesting experiences when I had a baseball signed in person and a so-called expert told me it was a fake. As a matter of fact, many auction houses and autograph experts contact me to give them my opinion on whether a signed ball is legit. In addition, my collection is not for sale nor will it ever be for sale. As a matter of fact, it is in my will that the collection shall be passed down to my loved ones. You must have spent a fortune on balls and postage that have never been returned? I once figured it out that the amount of money that I have spent on balls, postage, materials and shipping services which were never returned exceeds $30,000. Yes a very expensive hobby – but if you look at it over the course of 20 years, that is not so bad! That is why when you do score the signature of a world leader on a baseball, you realize how unique it truly is. 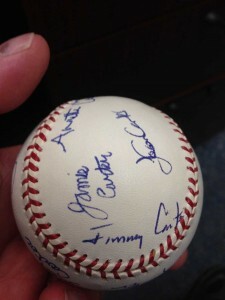 Do baseballs signed while the signee was in office have more cachet for you, or doesn’t it matter? I see you’ve already obtained the signatures from many of the candidates for the next US president. Will you also be trying to obtain their autograph once they’re in office? Yes it is great to get signatures of world leaders while they are in office, if for no other reason than the access to them is very limited. It is much less so after they have left office. I always try and have signed baseballs from the next president, first lady and vice president well in advance of the four-year election cycle . Yes, it is nice to get it while in office as well and I usually try to accomplish that. What is the one ball you would save in a fire? Mandela, the Dalai Lama, Obama perhaps? That’s like asking Paul McCartney which piece of handwritten sheet music would he save from the fire? They all have special meaning, even some of the smaller nations. Luckily they are in a fireproof safe in a storage facility with an insurance policy just in case. Your collection has been on display in the past – where is it now? Since 2008, my collection has been exhibited at five presidential libraries and museums throughout the United States. I just found out that my collection will be on display this Fall at the Cradle of Aviation Museum in Garden City, NY (Long Island) to coincide with the Election Day season. I’m very excited as this is a world class museum similar to the Smithsonian Air and Space Museum in Washington, D.C.
My dream is to have it exhibited at the visitors’ center at the United Nations in NYC or the Baseball Hall of Fame in Cooperstown, NY. You only acquire signatures from living persons. Any names you regret not getting? Boris Yeltsin, Francois Mitterrand, Ariel Sharon, Hugo Chavez. Fidel Castro would have been a great one to try and acquire on a baseball. Although he is not dead, he is tough these days. 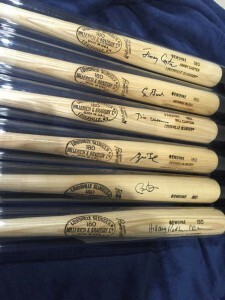 If only I would have started collecting the presidential signed bats a decade or two earlier, I could have had Presidents Nixon, Reagan and Ford sign one for me as well. Many of your signed baseballs must be unique, am I right? I can’t imagine Hamid Karzai has signed many, for example? Yes – many are definitely unique. I have had some leaders sign a baseball who truly didn’t even know what a baseball was. Many of the more remote African leaders expressed that, including the late Benin president Mathieu Kerekou. Do you have a preferred make of ball? What about the pen? I only use Official Rawlings Major League Game Baseballs as they are of the highest quality and thus they cost between $15.00 -$25.00. Even though these are of a higher quality, you have to realize that a baseball is just a painted piece of cowhide. It was never meant to host an autograph! I have baseballs that were signed 20 years ago that are bright white and not faded at all. Then there are some that were signed six months ago and have spots and are already yellowing. It makes no difference to me what pen is used. A black or blue ballpoint is great as is a black sharpie. Some folks will say never use a sharpie as the autograph will bleed into the ball. I only have maybe one or two that have faded into the ball. The only no no is a blue sharpie – never use that as it almost always bleeds into the leather. Do you do anything to preserve the signatures? Nothing other than placing them in UV protected plastic cubes and storing them in a dark safe in a storage facility. When the baseballs are on exhibit at a museum I make sure that the foot candles are set at an acceptable level to prevent any exposure to potential harmful natural or artificial light. Have any leaders sent you a signature unexpectedly? I wish! Although I am so particular about what balls I get signed, I would probably need to resend them one if it wasn’t on the correct type of ball. But here is a great story. About 10 years ago President Carter’s son Jeff took a box of baseballs to his family’s Christmas dinner gathering so he could have them all sign baseballs for my collection. I remember receiving the package back then with all the baseballs and was thrilled. A few months back, President Carter must have been cleaning out his closet and found one of the boxes of additional signed baseballs addressed to me. When I received the box recently I was shocked because the postage on the package was dated from a decade ago. When I opened the box, it contained two signed baseballs from that 2005 Christmas gathering. One signed by the entire Carter family including President and Mrs Carter, their kids and the grandchildren and one signed by Amy Carter alone. You don’t pay for signed balls, is that right? Correct! 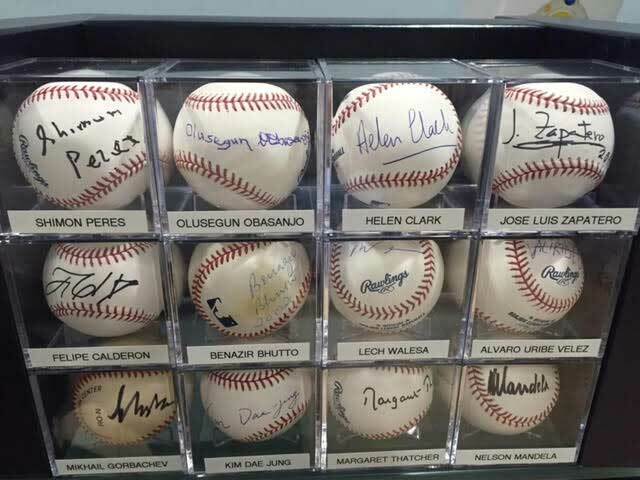 Thus the idea that The Kaplan Collection is just that – a collection of signed baseballs that I have assembled on my own or through the assistance of a top government official. The value is in the eye of the beholder! This is what makes it unique and special to me. 20 years ago I bought a very poor condition signed Harry Truman baseball at auction but have since sold it when I realized that I only want my collection to feature items that I obtained, not anything that was purchased at auction. Do have any idea about the value of your collection? Would you ever sell it? I know what it is worth to me but others may not agree. 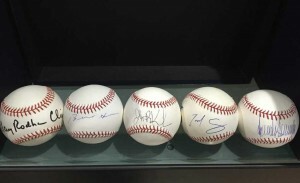 Many of these rare signed baseballs are one of a kind and cannot be replaced. Collectively, the collection is priceless. When a museum hosts an exhibit of my collection, I need them to issue a certificate of insurance coverage in the $1 million range. I never plan on selling it. It brings me too much joy. Who is next on your list to get? Where do I start? 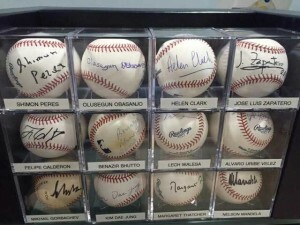 The following folks are among the scores of world leaders that I have been trying to get a signed baseball from for years: Nicolas Sarkozy, Vladimir Putin, Dmitry Medvedev, Junichiro Koizumi, Paul Kagame, Jean-Bertrand Aristide, King Albert II of Belgium, Viktor Yushchenko, Xi Jinping, Hosni Mubarak and Joyce Banda. What does it feel like to obtain an autograph you thought near impossible? Brief euphoria and then on to what is the next impossible task! I will say that getting President Obama to sign my baseball bat earlier this year was a huge victory. What affects a ball’s value? How important is signing in the sweetspot? Since I am not ever parting with my collection, it makes no difference to me where a world leader signs nor do I care what medium they use to sign it. I do not care where the baseball is signed as long as the signer does not cross over the red stitching or sign across multiple panels. 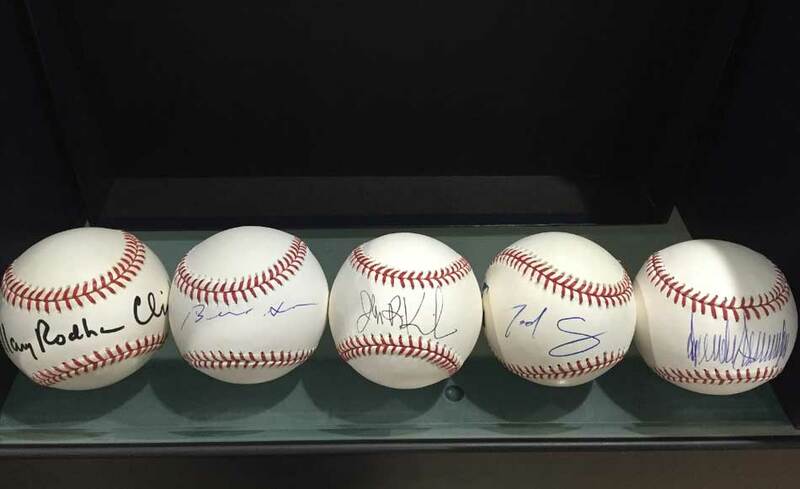 If you are going to sell your signatures, most auction houses and authenticators will tell you that they prefer the signature to be signed on the sweetspot of a Major League Baseball either in blue or black ballpoint pen. How much more valuable is a signed baseball than a signed photo – are you able to put a figure on it? From my experience as a long time collector – it seems that a signed baseball can be worth as much as 10-20 times the value of a common signed picture or such. But that number could vary depending on the individual and if there is a strong desire for his/her signature on a baseball. Like the time I was standing directly next to Japanese prime minister Junichiro Koizumi on the street in NYC during the UN General Assembly and I implored him to sign my ball but he refused. Or the time I arrived at a function where Prince Charles was going to be present and I was 10 feet away from him. I asked him to sign my baseball and the State Dept and Secret Service would not allow him to walk towards the fence to do so. He threw his hands up in the air like there was nothing he could do about it. Then there was the time Iraqi president Jalal Talabani was entering a hotel lobby with the aid of a cane after some surgery and he could not move his arms from the cane to sign! Learn more about Randy’s collection at www.thekaplancollection.com. Or contact Randy directly at randy_kaplan@yahoo.com.